Are You The Ultimate Cat Lover? 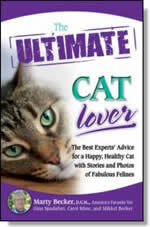 In this book, Dr. Marty Becker, known as "America's Favorite Vet," shows us how to be the ultimate cat lover. I was fortunate enough to receive a free evaluation copy of this book in exchange for an honest review. Whether you're just looking for a reference to call on for expert advice, a conversational book with photos of cats to share with your house guests, or you just want to add this book to your collection, this book promises to deliver (see review below). 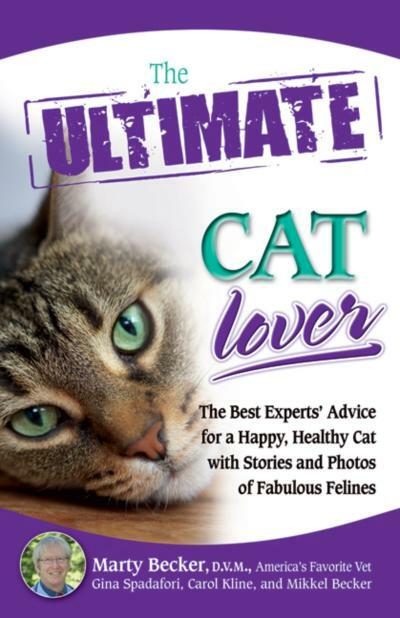 THE ULTIMATE CAT LOVER: The Best Experts' Advice for a Happy, Healthy Cat with Stories and Photos of Fabulous Felines is published by Health Communications, Inc., and filled with expert advice on feline care and health. Written by Dr. Marty Becker, DVM, (along with Gina Spadafori, Carol Kline, and Mikkel Becker), this book is filled with advice from feline experts, including a section on solving litter box problems contributed by Dr. Gary Landsberg, DVM. It's also got sixty pages of full page cat photos and stories that will please any feline fan. "Did you know that purring has been scientifically shown to promote healing? Those Egyptian cat worshippers knew what they were doing." You'll meet a number of interesting cats in this book through reading their stories. If you'd like to learn more about cat behavior, this book has interesting tales with examples of all kinds of interesting personalities. You'll meet Mikey, the Carnival Cat. You'll meet Hemingway, the adopted six-toed stray who demanded attention, and taught an aloof kitty named Bella how to be more social. You'll read about Shotsie, the Career Cat. Some cats have jobs, and Shotsie has several. Shotsie is a housekeeper, collecting any pieces of clothing that have been left out of place and bringing them to the hamper. She also taught the new kitten in the house not to scratch the furniture. Along with Dr. Marty Becker, the book is written with Gina Spadafori, Carol Kline, and Mikkel Becker. The book has a resources section, including details on all the writers and photographers. It's filled with photos, including those by Maggie Swanson and Troy Snow. Make sure you see Troy Snow's article on how to take cat photos. Books make great cat lover gifts, so here are some more cat books you might like. Dr. Marty Becker, is the nationally recognized pet correspondent for Good Morning America, and appears on other television shows, such as The Martha Stewart Show and Fox Television's Morning Show with Mike and Juliet. He also contributes to a weekly syndicated pet column, and has a PBS television series, The Pet Doctor with Marty Becker.